The EPA has approved the 4-hour Lead Renovator RRP Refresher Training to be taken fully ONLINE every other renewal period. 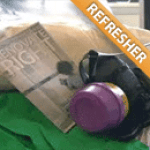 If taken online, the EPA Lead Renovator Refresher course is valid for 3 years, and the next refresher course you take will have to be completed in-person. In-person EPA Lead Refresher classes are valid for 5 years. If you work in any of the following states, you CANNOT take the online version of this course - training must be done IN-PERSON: AL, DE, GA, IA, KS, MA, MS, NC, OK, RI, UT, or WI. For individuals who have previously completed the Lead Renovator Initial Certification training in compliance with the Renovation, Repair, and Painting (RRP) rule, this 4-hour Refresher Course is required to renew your individual Lead-Safe Renovator Certification. Recertification is required every five years in states under EPA jurisdiction, and some EPA-authorized state programs require more frequent renewal. Our courses are delivered by experienced instructors, and will provide you with all the current information you need to successfully and safely perform Lead Safe RRP work in the field. Refresher training must be completed prior to your expiration date in most states. Students MUST provide a copy of a valid initial training certificate or card to participate in the refresher training. If your certificate has already expired, or if you have not attended the 8 hour initial course, please view the Lead Renovator Initial Course Schedule. An excellent instructor and very thorough. An excellent instructor and very thorough. The instructor was clear and concise in getting message across to the students. Took time to focus and review key points... The instructor was clear and concise in getting message across to the students. Took time to focus and review key points that were very helpful on test. He conducted class admirable; all while dealing with a glitch in the A/V equipment. Great job. A very good instructor. The refresher course was good to attend. A very good instructor. The refresher course was good to attend. Best instructor I've had by far. Very knowledgeable, provided numerous real world solutions to many common issues faced with... Best instructor I've had by far. Very knowledgeable, provided numerous real world solutions to many common issues faced with RRP. I will definitely be sending my guys to this class in the near future. The presenter was well prepared and knowledgeable and the class went very smoothly. The presenter was well prepared and knowledgeable and the class went very smoothly. Class was small. The instructor was knowledgeable and friendly. All in all I would say it was a positive experience. Class was small. The instructor was knowledgeable and friendly. All in all I would say it was a positive experience. The instructor had a pleasant disposition and made the class enjoyable. The instructor had a pleasant disposition and made the class enjoyable. Very complete and competent instruction. Very complete and competent instruction. Very informative class. The instructor was very thorough in teaching. Although it was only a refresher course, it was filled... Very informative class. The instructor was very thorough in teaching. Although it was only a refresher course, it was filled with great information. Good information. Concise and to the point. Good information. Concise and to the point. Excellent. What more can I say? Excellent. What more can I say? Very informative. Great instructor. Very thorough and patient. He made sure all students received and understood the information... Very informative. Great instructor. Very thorough and patient. He made sure all students received and understood the information being presented. The course was great! The course was great! Great instructor and class. Got right to the point and got the job done. Great instructor and class. Got right to the point and got the job done. The instructor did a great job. It was one on one and I couldn’t have asked for a better lesson. To review this was very... The instructor did a great job. It was one on one and I couldn’t have asked for a better lesson. To review this was very helpful, a lot of things have been forgotten over time, now they are reinforced. The course was good. The course was good. The trainer was very articulate in his explanation of lead based paint repair and renovation guidelines. Would highly recommend... The trainer was very articulate in his explanation of lead based paint repair and renovation guidelines. Would highly recommend for future recertification. Excellent instructor, explained the key points and made the class interesting. Excellent instructor, explained the key points and made the class interesting. An excellent instructor. He taught the class with how we can actually use what we learned and apply on the job site. An excellent instructor. He taught the class with how we can actually use what we learned and apply on the job site. The class was to the point and he answered several questions. The class was to the point and he answered several questions. The instructor was very helpful and informative. He was very easy to talk to and listened to my questions; very likable person. The instructor was very helpful and informative. He was very easy to talk to and listened to my questions; very likable person. The course was great. The course was great. Efficient and effective. They did a great job! Efficient and effective. They did a great job! Had one of best instructor. Very pleased. Had one of best instructor. Very pleased. Instructor was very knowledgeable and informative. Well prepared and experienced, not just academic in knowledge. Kept... Instructor was very knowledgeable and informative. Well prepared and experienced, not just academic in knowledge. Kept my interest and made the class a pleasant experience. Two classes were cancelled the day before they were scheduled. Luckily, another class was available before our guys certifications... Two classes were cancelled the day before they were scheduled. Luckily, another class was available before our guys certifications expired. Our attendees felt the Lead Renovator class was well worth their time. The refresher course was very well done. The instructor was informative and easy to follow. The refresher course was very well done. The instructor was informative and easy to follow. Very professional and I do recommend!! Very professional and I do recommend!! Very thorough class. Lots of good information I would recommend it to anybody! Very thorough class. Lots of good information I would recommend it to anybody! Awesome review and instructor! Awesome review and instructor! They were very knowledgeable and friendly. They were very knowledgeable and friendly. A friendly, professional instructor. He moved through the material at a good speed, not too fast, not too slow and made... A friendly, professional instructor. He moved through the material at a good speed, not too fast, not too slow and made sure every was able to keep up. Best class ever! Best class ever! Course was what I expected. Course was what I expected. Course was well suited, concise and straight to the point. Highlighted any/all changes in past few years and the NC specific... Course was well suited, concise and straight to the point. Highlighted any/all changes in past few years and the NC specific content was crucial. The instructor was awesome and delivered the RRP requirements eloquently. The instructor was informative and yet rough around the edges. I believe that this made him relatable to many of the students.... The instructor was informative and yet rough around the edges. I believe that this made him relatable to many of the students. He focused a lot of attention on ppe and the fastall vac system. Things that weren't really highlighted in my first class five years ago. The Instructor was great. It was like a one on one experience. He was very knowledgeable in the lead program. The Instructor was great. It was like a one on one experience. He was very knowledgeable in the lead program. The instructor was very knowledgeable. Kept the class engaged. I was pleased with this training. The instructor was very knowledgeable. Kept the class engaged. I was pleased with this training. Excellent small group study. Excellent small group study. The best instructor I've had so far, Steve went over all of the class material and made sure his class understood the information... The best instructor I've had so far, Steve went over all of the class material and made sure his class understood the information being presented. Fantastic Instructor!! We have multiple associates who require this course and will be looking into using your company... Fantastic Instructor!! We have multiple associates who require this course and will be looking into using your company for the training. Great info, clearly presented. Great info, clearly presented. Is very good class. Is very good class. She was extremely knowledgeable, personable and made the class more interesting than it normally has been in the past. She was extremely knowledgeable, personable and made the class more interesting than it normally has been in the past. Informative and kept my attention. Informative and kept my attention. Very informative. Instructor did an excellent job. Very informative. Instructor did an excellent job.